The halophilic archaeon Halobacterium salinarum expresses bacteriorhodopsin, a retinal-protein that allows photosynthetic growth. Transcription of the bop (b acterioop sin) gene is controlled by two transcription factors, Bat and Brz that induce bop when cells are grown anaerobically and under light. A new gene was identified that is transcribed together with the brz gene that encodes a small basic protein designated as Brb (b acteriorhodopsin-r egulating b asic protein). The translation activity of the start codon of the brb gene was confirmed by BgaH reporter assays. 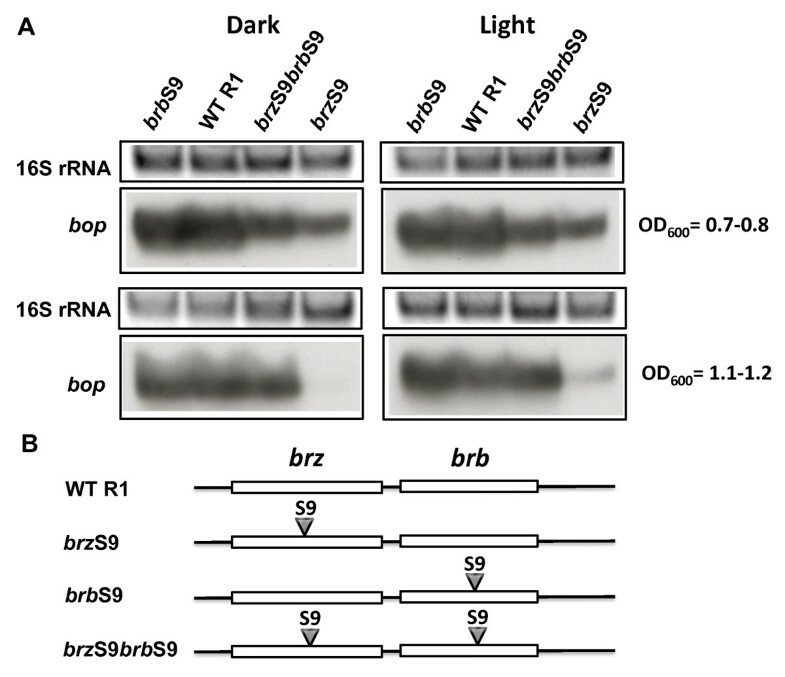 In vivo site-directed mutagenesis of the brb gene showed that the Brb protein cooperates with Brz in the regulation of bop expression. 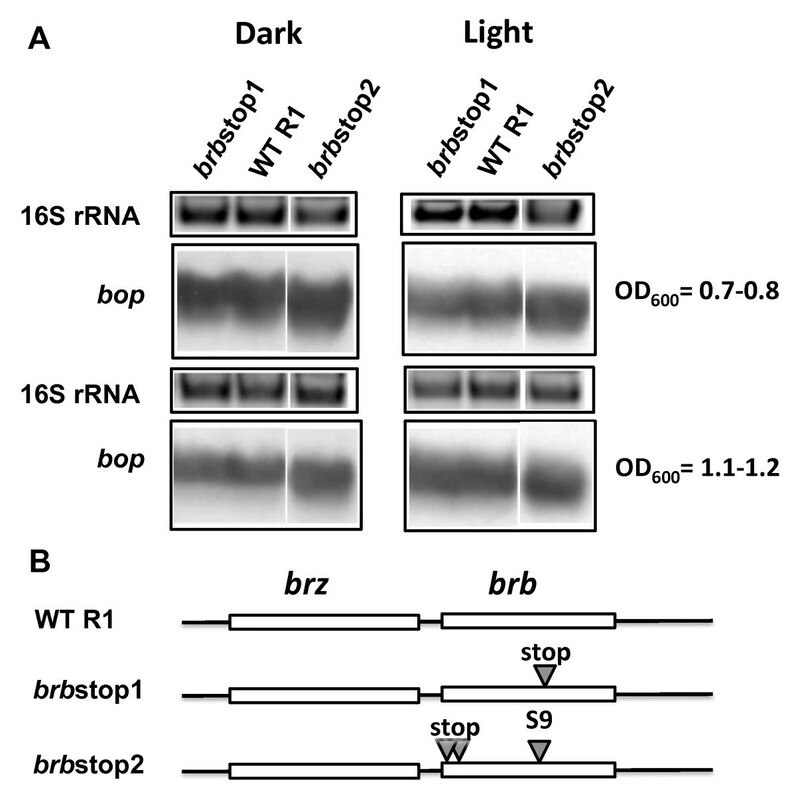 Using a GFP reporter assay, it was demonstrated that Brb cooperates with both Brz and Bat proteins to activate bop transcription under phototrophic growth conditions. The activation of the bop promoter was shown to be dependent not only on two major factors, Bat and Brz, but is also tuned by the small basic protein, Brb. Halobacterium salinarum is a halophilic archaeon utilizing light to produce ATP via a retinal-based photosynthetic system. The key component of this system is a light-driven proton pump consisting of the integral membrane apoprotein bacterioopsin (OE3106F, VNG1467G) with a covalently attached retinal. Under conditions of low oxygen and high light, b acterior hodopsin (BR) is highly expressed and forms two-dimensional crystals in the cell membrane, the so-called purple membrane [1, 2]. Bacterioopsin is encoded by the bop gene, clustered in a locus together with other genes related to its synthesis (additional file 1). One of these is brp (b acterioopsin-r elated p rotein) (OE3102R, VNG1465G) [3–5]. Brp, as well as the paralog Blh (blh is located 500 kbp from the bop locus), are enzymes that convert beta-carotene to retinal . Another gene near bop is crtB1, which encodes phytoene synthase (CrtB1), an essential enzyme for bacteriorhodopsin production. CrtB1 catalyzes the synthesis of phytoene from the geranylgeranyl pyrophosphate, a key step in the retinal biosynthetic pathway . Also clustered with bop are several genes of unknown function, which are conserved among photosynthetic haloarchaea . One of them is blp (b op-l inked p rotein, OE3100F, VNG1463G), encoding a protein co-regulated with the bop gene . The other three are: bac (b acterioopsin a ssociated c haperone, OE3098R, VNG1462G), encoding a paralog of Cdc48, an AAA-ATPase cell division cycle protein; bap (b acterioopsin a ssociated p rotein, OE3107F, VNG1468H), a small ORF, following the bop gene ; and the OE3095R gene (VNG1459H), coding for a protein of unknown function but possessing a zinc finger like motif that could function in DNA binding . The brp gene is transcribed together with bat, a gene encoding a transcription factor (b acterioopsin a ctivator of t ranscription, OE3101R, VNG1464G) that activates the bop operon [11, 12]. The Bat protein contains GAF and PAS/PAC domains, as well as a C-terminal DNA-binding helix-turn-helix motif  and induces the bop operon in the presence of light and at low oxygen tension [11, 13]. 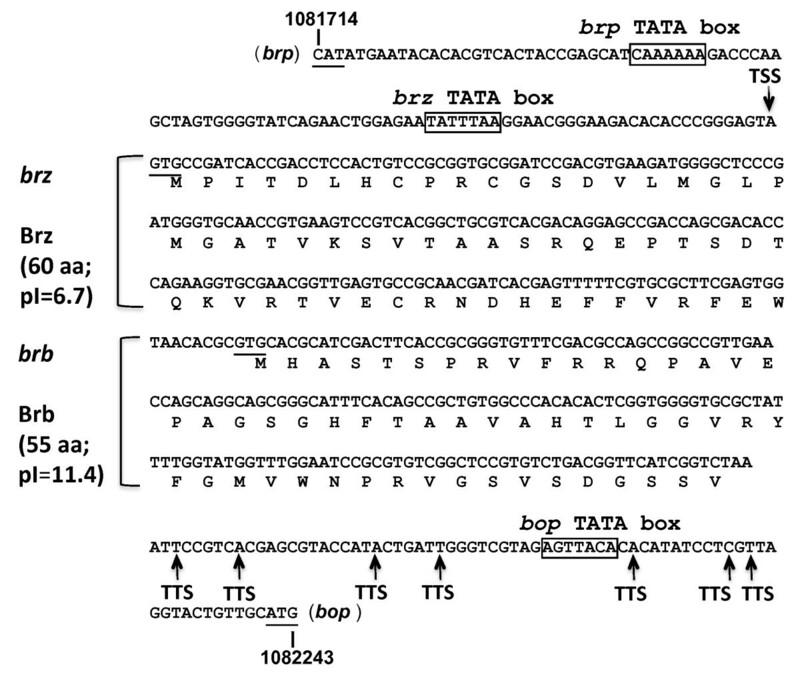 Mutations in Bat were suggested to be responsible for the phenotype of constitutive BR-overproduction in the S9 mutant strain of H. salinarum [14, 7]. Another protein factor regulating bop transcription is Brz (b acterioopsin r egulating z inc-finger protein, OE3104F, VNG1466H), a small zinc finger protein (60 aa) The brz gene is located between the brp-bat and bop operons, and previous work has shown that Brz is not only involved in the regulation of bop, but also of crtB1, OE3107F and OE3095R . Since crtB1 codes for a phytoene synthase, Brz appears to be a regulator of both the Bop apoprotein and the retinal chromophore production. Such co-regulation is possible by binding to an upstream activator sequence in the promoters of both bop and crtB1 operons [15, 7]. DNA microarray studies of brz mutants showed that the regulatory effects of Brz on the bop operon are not mediated via Bat. This indicates two possibilities for bop regulation: either a regulation of Brz via Bat or the cooperation between Bat and Brz at the protein level . OE3095R, a protein containing a CPxCG-related zinc finger motif could also be involved in a hierarchical bop gene regulatory network . Long before the brz gene was identified, differences in the nucleotide sequence of this region were reported between mutant S9 and the wild type R1 strain. Sequence differences were also reported downstream of brz but before bop. Until now, it was not clear if these changes were relevant to the BR overproducing phenotype of strain S9 [3, 16]. Besides Bat, Hbt. salinarum also carries two homologues of Bat, annotated as boa2 and boa4, but their functions have not yet been experimentally determined. Adjacent to boa2 (OE3134F, VNG1488G) and boa4 (OE2448F, VNG0996G) are genes encoding small proteins that also contain CPxCG-related zinc finger motifs: OE3131F (VNG1486H, 53 aa) and OE2447F (VNG0995H, 62 aa). In this study we investigated the functions of two transcription factors, Brz and Bat, in the context of bop gene regulation. We show that the brz mRNA is bi-cistronic and the additional ORF encodes a small basic protein, Brb. The protein could not be detected by mass spectrometry but the translation activity of start codon of the brb gene was confirmed by BgaH reporter assays. The requirement of this protein for bop transcription, and the relevance of S9 mutations of brz and brb to the S9 phenotype, was tested by site-directed mutagenesis in vivo. In addition, a cooperation of three proteins, Bat, Brz and Brb, for light dependent activation of the bop promoter was demonstrated using a GFP reporter assay. In a previous study, Brz was identified as a second regulator of bop transcription in Hbt. salinarum . This changed a simple model of bop transcription control from one using only one activator, Bat, to a more complex system with two indispensible activators that probably interact with each other. The same study also showed that the regulatory effects of Brz on bop are not mediated via Bat . In the current study, the activation effect of Bat on bop via direct regulation of Brz by Bat was excluded by the phenotype of Δbat mutants, in which transcription of brz was found not to be down-regulated (data not shown). These results strongly suggest that Bat and Brz cooperate at the protein level. In addition, a new candidate for cooperation with Brz and Bat was found to be encoded by a small ORF on the brz mRNA. The existence of this ORF was recognized after 3'-end determination of the brz transcript. For this, the mRNA was circularized and the joined ends reverse-transcribed and PCR amplified according to the method described by Brenneis; 2007 . The 3'-ends of the brz mRNA were located 173-228 bp downstream of the brz stop codon (Figure 1), in some cases downstream of the TATA box of the adjacent bop gene. Although mRNA degradation cannot be excluded as a cause of the multiple 3' ends detected by RACE, previous studies have shown that ragged transcription termination is common in Archaea . These results correlate well with the position of the 3'-end of the brz mRNA reported previously by Koide; 2009 , who used a different approach that averaged the signals from the mRNA population. They located the 3'-end of the message at 226.95 bp from brz stop codon. In both cases, there are sufficient nucleotides downstream of the brz stop codon to encode a small protein of 5.7 kDa (55 amino acids long) with an alkaline pI of 11.4 (Figure 1). The gene was named brb (b acteriorhodopsin-r egulating b asic protein) as, later in the current study, it was found to be involved in regulation of bop transcription. According to RT qPCR results, brz-brb transcript level is as low as the level of bat transcripts (data not shown). Operon organization of the brz and brb genes of Hbt. salinarum R1. The protein sequences are given below the nucleotide sequences. The arrow above the nucleotide line indicates the transcription start site (TSS) and arrows below show transcription termination sites determined by 5'-3'RACE (TTS). The TATA motifs of the brz, brp and bop genes are indicated by boxes. To test the translation activity of the start codon of the brb gene, a mutant producing an N-terminal BgaH fusion protein was constructed by insertion of a suicide plasmid into the brz-brb locus. The construct (pVYT1 plasmid) contained the 5'-end of the brb gene fused to the bgaH reporter gene (lacking its own translational start codon), thus translation could only start from the start codon of the brb gene (Figure 2A). Enzymatic activity of the Brb-BgaH fusion protein was detected on agar plates containing X-gal. Colonies of the mutant became blue (Figure 2B). In a control experiment, a mutation eliminating the brb start codon (GAG instead of GTG; pVYT2 plasmid) resulted in red colonies (BgaH-) on the plates with X-gal (Figure 2C), proving no other potential start codons were active upstream or downstream of the tested brb start codon. Test of brb translation start codon activity. Panel A represents the organization of the brb and bgaH genes in the chromosome of Hbt. salinarum after integration of suicide plasmids pVYT1 and pVYT2 (additional file 9). Panel B shows colonies of a strain expressing an active Brb-BgaH fusion protein (insertion of pVYT1) on plates containing X-gal (40 μg ml-1). Panel C presents a control mutant lacking β-galactosidase activity as a result of elimination of the brb start codon in the brb-bgaH gene fusion (insertion of pVYT2). Attempts to detect the gene product, Brb, in various WT cell fractions using mass spectroscopy were not successful, possibly due to low levels of this protein, consistent with the low level of brz-brb transcripts by RT qPCR. The small size and high pI value may also be contributing factors limiting the number of endoproteolytic peptides available for the identification. We also tried to produce samples for analysis that were enriched in Brb. For this purpose, a mutant was constructed which carries an insertion of the DNA fragment encoding the c ellulose b inding d omain (CBD) in frame and just upstream of the stop codon of the brb gene. No visible band corresponding to a BrbCBD fusion protein was observed on the gels and no BrbCBD fusion protein was found by mass spectrometry, again probably due to low amount of the fusion protein expressed under the native promoter. 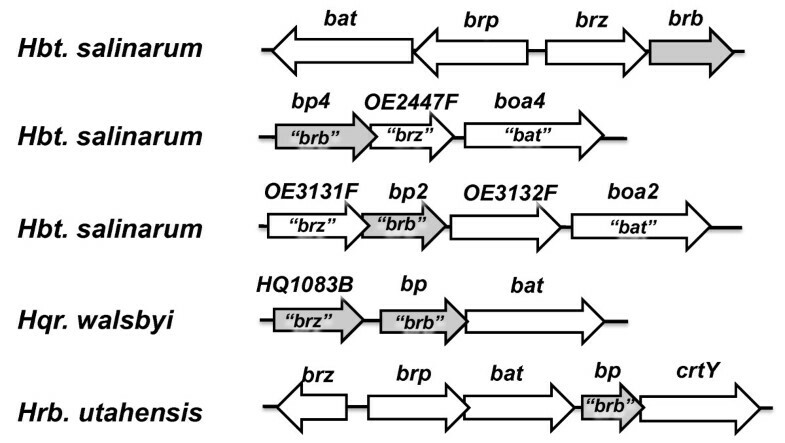 Two series of mutants in the brz-brb region were produced to demonstrate the involvement of Brb in regulating bop transcription. One series used a wild-type brz background, and the second used a brz inactive mutant (brz S9) as the parental background. Although BrbCBD fusion protein was unable to be detected, the brb CBD mutant produced less bop mRNA and BR than wild-type cells, indicating a role for Brb in bop expression (Figure 3; Table 1; Table 2). Given the negative effect of the BrbCBD fusion on bop gene expression, the role of Brb was assessed next by translational knockouts. Two knockout mutants having stop codons in the brb gene were constructed: brb stop1 and brb stop2 (Figure 4). The brb stop mutants were constructed instead of the brb deletion mutant to avoid any possible polar effects of the deletion on transcription of the neighboring genes. The brb stop1 mutant had a stop codon in the middle of the brb gene and so should produce only the first half of the Brb protein. Mutant brb stop2 contained two stop codons at the beginning of the brb gene. The bop mRNA (Figure 4) and BR levels (Table 1, Table 2), were found to be the same as in wild-type cells in both mutants. The lack of a phenotype could be explained either by the residual activity of a proposed protein complex that regulates bop transcription in the absence of Brb protein, or by the ability of the putative complex Bat/Brz to recruit other proteins able to substitute Brb functionally. In the first case, appropriate mutations in the Brb sequence could have more deleterious effects than a knock-out of brb. To test this, mutants were constructed based on old observations of changes in brz and brb that were previously published in a study of Hbt. salinarum strain S9, long before these ORF's were recognized to be involved in bop regulation [3, 16]. The S9 strain is a constitutive BR-overproducer, and mutations in Bat were suggested to be responsible for this phenotype . However, if there is a cooperation of Bat with Brz and Brb, mutations in brz and brb could also contribute to the phenotype in a bat wild-type background. Therefore, the naturally selected mutations in brz and brb of S9 were introduced separately or together into R1 wild-type cells, using the pop-in/pop-out gene replacement method. The brz mutations S9 converted Val to Ala, and Ala to Thr located in a region of high homology with Brz from the archaeon Halorhabdus utahensis (additional file 2). The brb gene mutations S9 resulted in a frame shift and translation of a protein with the N-terminal half of the native Brb followed by a new C-terminal sequence (additional file 2). Effects of CBD domain insertion in the brb gene on bop transcription. In panel A, the upper blocks represent the 16S rRNA bands on the agarose gel stained by ethidium bromide. The lower blocks show northern blots of total cell RNA after probing with labeled DNA fragments containing the bop gene. Cells were grown in the dark and light. Culture OD600 at which RNA was extracted is given at right. WT R1, wild-type strain R1; brb CBD, brb CBD gene fusion strain. 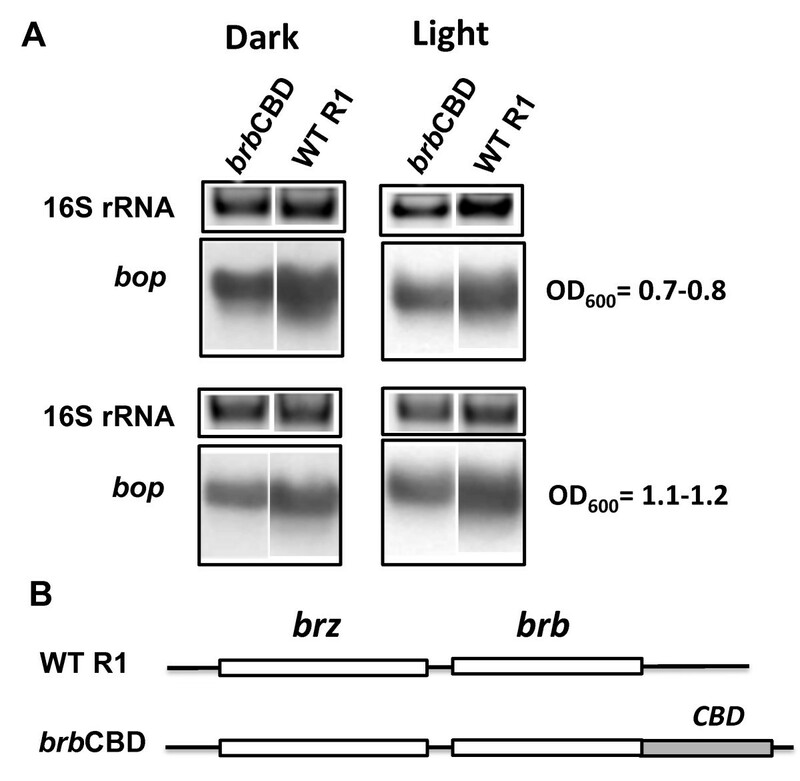 According to densitometry, the levels of bop mRNA (normalized to 16S rRNA) from the brb CBD mutant corresponded to 67 ± 2% (OD600 = 07.-0.8), 70 ± 2% (OD600 = 1.1-1.2) of WT in the dark, and 85 ± 3% (OD600 = 07.-0.8), 85 ± 2% (OD600 = 1.1-1.2) in the light. Panel B shows the locations of mutations in the brz and brb genes. For BR measurement cell samples were taken at the same time as for northern blot analysis. BR concentration values are given in μM. Cell samples were taken at the same time for northern blot analysis and BR measurement. Effects of inactivation of the brb gene translation on bop transcription. In panel A, the upper blocks represent the 16S rRNA bands on the agarose gel stained by ethidium bromide. The lower blocks show northern blots of total cell RNA after probing with labeled DNA fragments containing the bop gene. Cells were grown in the dark and light. Culture OD600 at which RNA was extracted is given at right. WT R1, wild-type strain R1; brb stop1, strain brb stop1; brb stop2, strain brb stop2. According to densitometry, the levels of bop mRNA (normalized to 16S rRNA) from strain brb stop1 were: 117 ± 5% (OD600 = 07.-0.8), 86 ± 4% (OD600 = 1.1-1.2) of WT in the dark, and 106 ± 2% (OD600 = 07.-0.8), 132 ± 9% (OD600 = 1.1-1.2) in the light; from strain brb stop2 they were: 175 ± 6% (OD600 = 07.-0.8), 95 ± 4% (OD600 = 1.1-1.2) of WT in the dark, and 124 ± 9% (OD600 = 07.-0.8), 118 ± 11% (OD600 = 1.1-1.2) in the light. Panel B shows locations of the mutations in the brz and brb genes. In the initial round, two single mutants, brz S9 and brb S9 as well as a double mutant brz S9brb S9 were produced (Figure 5). Northern blot analysis showed the mutated brb gene (brb S9) had no effect on bop transcription if the brz gene was from wild-type (Figure 5; Table 2; Table 3). In contrast, cells with the wild-type brb gene but mutations in the brz gene (brz S9) showed down-regulated levels of bop mRNA and BR expression (Figure 5; Table 2; Table 3). The effect was more prominent at the stationary (OD600 = 1.1-1.2) stage of growth and did not depend on the presence of light. Surprisingly, the double mutant carrying both changes, brz S9brb S9, showed bop mRNA level elevated up to that of wild-type and BR expression up to half of the wild-type level at the stationary stage of growth (Figure 5; Table 2; Table 3). Apparently, the Brb protein can be omitted genetically at the level of the wild-type Brz either completely or with sequences like that of the brb S9 mutation. However, at the level of the brz S9 mutant knocking out BR regulation, the BrbS9 protein can rescue the S9 mutation of brz to restore bop mRNA levels up to that of WT. Since the naturally selected C-terminal sequence of Brb in the brb S9 strain shows this compensatory effect, a further two control mutants were produced, brb M1 and brz S9brb M2, with frame shifts changing only the sequence of the C-terminal part of the Brb protein beyond amino acid 23 in an arbitrary manner (additional file 3). The single mutant, brb M1, possessed the wild-type Brz, and the double mutant, brz S9brb M2, carried the S9 mutation in Brz (Figure 6). The phenotypes of both mutants confirmed the dominant role of Brz and specificity of S9 mutations in Brb, as the M2 C-terminal sequence in contrast to the S9 C-terminal sequence in S9 restored the WT phenotype only to a small extent (Figure 6; Table 1; Table 2). 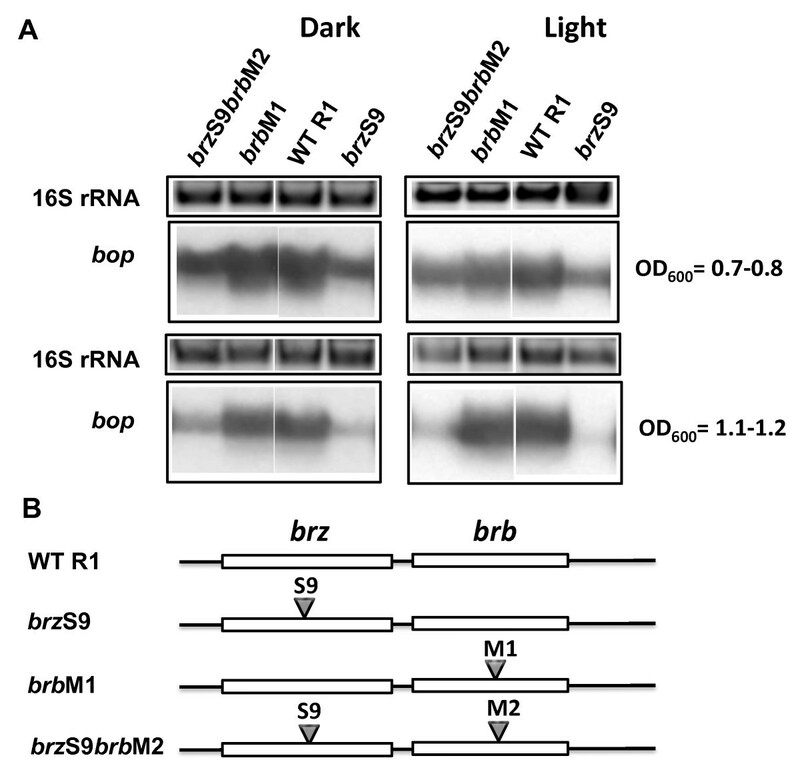 Effects of S9 mutations in the brz and brb genes on bop transcription. In panel A, the upper blocks represent the 16S rRNA bands on the agarose gel stained by ethidium bromide. The lower blocks show northern blots of total cell RNA after probing with labeled DNA fragments containing the bop gene. Cells were grown in the dark and light. Culture OD600 at which RNA was extracted is given at right. WT R1, wild-type strain R1; brz S9, strain brz S9; brb S9, strain brb S9; brz S9brb S9, strain brz S9brb S9. According to densitometry, the levels of bop mRNA (normalized to 16S rRNA) from strain brzS9 were: 59 ± 4% (OD600 = 07.-0.8), not detectable (OD600 = 1.1-1.2) of WT in the dark, and 65 ± 4% (OD600 = 07.-0.8), 25 ± 1% (OD600 = 1.1-1.2) in the light; from strain brbS9 they were: 88 ± 4% (OD600 = 07.-0.8), 119 ± 6% (OD600 = 1.1-1.2) of WT in the dark, and 135 ± 5% (OD600 = 07.-0.8), 147 ± 6% (OD600 = 1.1-1.2) in the light; and from strain brzS9brbS9 they were: 81 ± 5% (OD600 = 07.-0.8), 83 ± 2% (OD600 = 1.1-1.2) of WT in the dark, and 86 ± 5% (OD600 = 07.-0.8), 115 ± 6% (OD600 = 1.1-1.2) in the light. Panel B shows the locations of mutations in the brz and brb genes. Effects of M1 and M2 mutations in the brb genes on bop transcription. In panel A, the upper blocks represent the 16S rRNA bands on the agarose gel stained by ethidium bromide. The lower blocks show northern blots of total cell RNA after probing with labeled DNA fragments containing the bop gene. Cells were grown in the dark and light. Culture OD600 at which RNA was extracted is given at right. WT R1, wild-type strain R1; brz S9, strain brz S9; brb M1, strain brb M1; brz S9brb M2, strain brz S9brb M2. According to densitometry, the levels of bop mRNA (normalized to 16S rRNA) from strain brzS9 were: 58 ± 1% (OD600 = 07.-0.8), 20 ± 2% (OD600 = 1.1-1.2) of WT in the dark, and 46 ± 3% (OD600 = 07.-0.8), 10 ± 1% (OD600 = 1.1-1.2) in the light; from strain brbM1 they were: 95 ± 2% (OD600 = 07.-0.8), 129 ± 2% (OD600 = 1.1-1.2) of WT in the dark, and 82 ± 2% (OD600 = 07.-0.8), 105 ± 7% (OD600 = 1.1-1.2) in the light; and from the brzS9brbM2 they were: 74 ± 2% (OD600 = 07.-0.8), 47 ± 2% (OD600 = 1.1-1.2) of WT in the dark, and 64 ± 3% (OD600 = 07.-0.8), 33 ± 3% (OD600 = 1.1-1.2) in the light. Panel B shows the locations of mutations in the brz and brb genes. Taken together, these results suggest that Brb participates in the regulation of bop transcription and, further, that Brz and Brb proteins depend on each other for the activation of bop transcription. 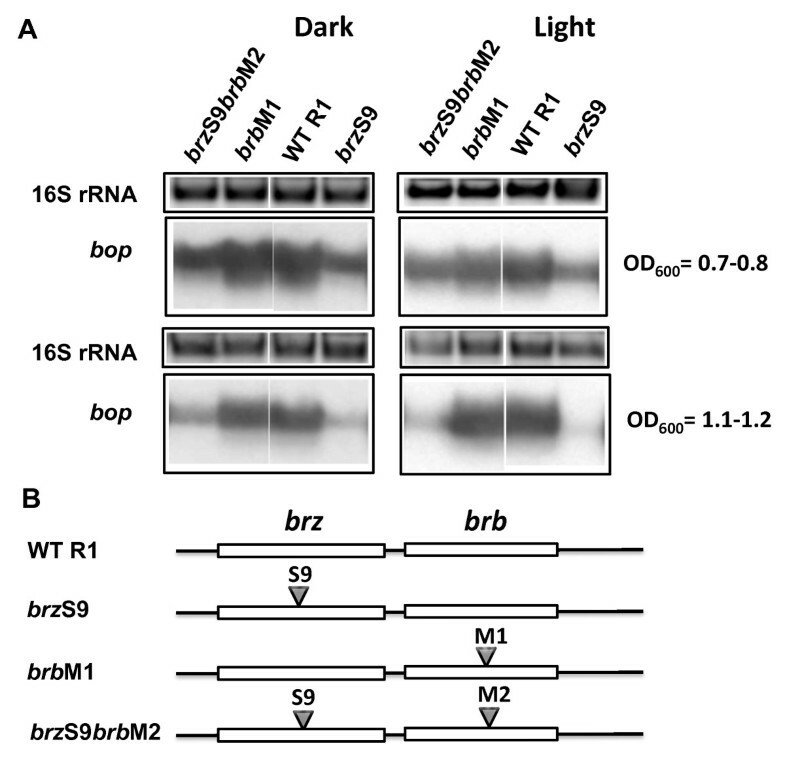 While Bat and Brz are crucial regulators of bop transcription, the results described above indicate that Brb is also at least marginally involved in this process. To further test a possible cooperation between the Brz, Brb and Bat proteins, a GFP reporter assay was established. Reporter plasmids contained the gfp gene and different sets of the brz, brb, bat genes in a single operon under the bop promoter control (Figure 7A). At the 3'-end a terminator sequence from the A flagellin operon was added. The reporter plasmids included replication origins of Hbt. salinarum and E. coli, and resistance markers for novobiocin and ampicillin. A control plasmid was identical except for using the OE3095R gene (coding for a conserved hypothetical protein in Hbt. salinarum, http://www.halolex.mpg.de) instead of brz, brb or bat, since its deletion did not effect bop transcription (data not shown). Expression of GFP in these constructs is controlled by the bop promoter, allowing the effects of Brz, Brb and Bat on bop promoter activity to be directly assessed. Activity of the bop promoter depending on brz , brb and bat genes expression according to GFP reporter assay. Panel A represents a map of the GFP reporter plasmid. In panels B, C, D, E kinetic of the bop promoter activity during cell growth is shown as GFP fluorescence intensity. The GFP fluorescence is measured in light (red circles) and dark (black squares) for different combinations of the expressed brz, brb and bat genes. OE3095R, transformant containing the reporter plasmid with the OE3095R gene (B); brz/brb/bat, transformant containing the reporter plasmid with the brz, brb, and bat genes (C); brz/bat, transformant containing the reporter plasmid with the brz and bat genes (D); bat, transformant containing the reporter plasmid with the bat gene (E). In each case at least three biological repetitions were performed. The background level of fluorescence in untransformed cells was constant (around 20 units) during cell growth. The wild-type cells R1 were transformed by the reporter plasmids and transformants were selected on plates containing novobiocin. Prior to measuring GFP activity, the transformants, grown in medium with novobiocin, were washed and then resuspended in novobiocin-free medium. This was to avoid the negative effects of novobiocin on bop promoter activity [19, 20]. For each transformant, cells were grown under light or dark conditions, and the fluorescence measured and compared. Plasmid copy number should not depend on the presence and absence of light, so the results for the same transformant should be directly comparable. Since light is an inducer of bop transcription, GFP fluorescence would only be expected to be increased in light versus dark conditions by the correct combination of Brz, Brb, Bat proteins expressed from the reporter plasmid. As shown in Figure 7, the enhancement of GFP fluorescence by growth of cells under light was only observed when all three genes: brz, brb and bat were present in the reporter plasmid. This indicates their cooperation for light mediated activation of the bop promoter. While the absolute values of GFP fluorescence varied between transformants carrying the same plasmid construct, as well as between transformants carrying plasmids with different constructs of brz, brb and bat, these variations do not effect the interpretation of light versus dark behavior of individual transformants, and were probably due to differences in plasmid copy number. This data clearly identifies a requirement for all three genes, brz, brb and bat, in bop induction. ORFs OE2447F and OE3131F encode hypothetical proteins that carry zinc finger motifs like Brz, and might also be involved in the bop gene regulation. For this reason, searches near these ORFs were conducted to check if they also possessed brb- like ORFs encoding proteins potentially able to substitute for the Brb protein. The 5' and 3' UTRs of many genes in Hbt. salinarum have been determined by Koide; 2009  and this data indicated that transcripts of both OE2447F and OE3131F were unusually long. The transcription start site (TSS) of OE2447F (OE2447F, 62 aa, pI = 4.2) lies 134.51 bp upstream of its start codon, while the transcription termination site (TTS) is located 741.21 bp downstream from the stop codon. The 134.51 bp region, upstream of OE2447F contains a small ORF in the same orientation as OE2447F (7 bp overlap), and can code for a small, basic protein (45 aa, pI = 9.4) (Figure 8; additional file 4). We designated this protein as b asic p rotein 4 (Bp4). Since the TTS of OE2447F is located 741.21 bp downstream from its stop codon, bp4 and OE2447F are co-transcribed with the boa4 gene. Additionally, a TSS for boa4, 865 bp upstream of the boa4 start codon, also supports co-transcription. For OE3131F (OE3131F, 53 aa, pI = 3.9), the analysis of TSS (0 bp from start codon) and TTS (86.8 bp from stop codon) revealed that, in the region 86.8 bp downstream of the ORF, another small ORF is present that overlaps with the 3'-end of OE3131F (9 bp) and is predicted to code for a basic protein (33 aa, pI = 12.0). This was designated as b asic p rotein 2 (Bp2) (Figure 8; additional file 5). Thus, besides the Brz/Brb pair, Hbt. salinarum has the potential to express two similar pairs of small zinc finger and basic proteins, which, together with the Boa4 and Boa2 proteins, could form complexes active in transcriptional regulation. Organization of brz , brb and their analogues in Hbt. salinarum , Hqr. walsbyi and Hrb. utahensis. Empty arrows indicate previously annotated genes and grey arrows indicate newly annotated ORFs. To test whether Bp2 and Bp4 are functional analogues of Brb, and also influence bop transcription, mutants with stop codons aborting translation of the bp2 and bp4 genes, bp2 stop and bp4 stop, were constructed from wild-type cells. The introduced stop codons did not effect BR expression (Table 3). To test a possible substitution of Brb by these proteins, the brb stop2 mutant was used as the parental strain to construct a double mutant having stop codons aborting translation of the bp2 or bp4 genes. Repeated attempts to make such double mutants were not successful even though the same pop-in/pop-out method was used that had readily been able to generate the previous bp2 or bp4 stop codon mutations. The results indicate that bp2 and bp4 are not essential by themselves, but may become significant in a brb knockout background. In Haloquadratum walsbyi, ORFs encoding a small zinc finger (HQ1083B) and a small basic protein (Bp) were also found upstream of the bat gene. The gene encoding the basic protein overlaps with the bat gene, so they are likely to be co-transcribed. The HQ1083B gene may be transcribed separately or together with bp and bat genes (Figure 8; additional file 6). The only close homologue of Hbt. salinarum Brz, is that carried by Hrb. utahensis. In this archaeon, the brz gene appears to be transcribed as a monocistronic mRNA, but an ORF encoding a small basic protein can be annotated between the bat and crtY genes (Figure 8; additional file 7). This ORF could either be part of an operon starting from the brp and ending just before crtY, or transcribed together with the crtY gene. An inhibitory effect of novobiocin on bop transcription was reported for the NRC-1 strain of Hbt. salinarum [19, 20], but its influence in R1 strain is not known. Although experimental care was taken not to allow novobiocin to interfere with transcriptional experiments reported here, we were interested to see the genome wide influences of novobiocin on transcription. Therefore, a DNA microarray analysis of the transcripts from R1 (and R1M1, a bacterioruberin deficient strain derived from the R1) was performed, comparing cells grown in the presence or absence of novobiocin (additional file 8). Surprisingly, bop transcription in the R1 (and R1M1) strain was not inhibited, but was 5-fold increased by the presence of 0.1 μg/ml novobiocin. This represents a clear difference to the behavior of the NRC-1 strain, even though R1 and NRC-1 are extremely similar in sequence . It most likely reflects a strain-specific mutation in the B subunit of gyrase in R1 cells (Lys-544-Asn; ), as novobiocin binds to and directly affects the gyrase. Attempts to generate an Asn-544-Lys mutant in R1 cells failed, possibly because of the important role of the B subunit of gyrase in recombination events during the pop-in/pop-out procedure. Besides the novobiocin-induced changes in bop transcription, the expression of many other genes were affected, including stimulation of gyrase and type I topoisomerases. These results are similar to the effects described previously in E. coli, where topoisomerases are known to be regulated by DNA supercoiling in a negative feedback loop . It has been reported also, that the expression of several heat-shock genes depends on the level of DNA supercoiling , and we detected as well an up-regulation of heat-shock gene hsp20. Finally, novobiocin exerted an up-regulating effect on genes of the basal transcription apparatus, while some genes encoding ribosomal proteins and many metabolic enzymes were down-regulated (additional file 8). The current study has shown that besides Bat and Brz there is a third protein, Brb (b acteriorhodopsin-r egulating b asic protein), involved in regulating bop transcription. The brb gene is co-transcribed with the brz gene, and is predicted to specify a small basic protein. Insertional mutagenesis of brb was shown to impair transcription of the bop gene and to lower BR expression. In addition, mutations in Brb could complement the effects of Brz mutations, indicating cooperation of the Brz and Brb proteins. At the same time, blocking expression of the brb gene by introducing stop codons did not effect bop transcription. This would be consistent with an interaction model where Bat and Brz can still form a functional complex without Brb, but a mutated Brb negatively effects function. The latter types of mutants are classified as dominant negative, and commonly reflect alterations in multisubunit complexes. For this type of mutation, null mutations of functionally redundant genes do not alter the phenotype . Redundant genes of Brb are likely to exist in Hbt. salinarum, as two other small basic proteins (Bp2 and Bp4) are predicted to be encoded by genes found in vicinity of the boa2 and boa4 genes, which code for Bat homologues. These genes (bp2 and bp4) were not previously annotated, but they are co-transcribed together with genes encoding small zinc-finger proteins according to published data on the transcription of these genes . Blocking of Bp2 or Bp4 expression did not affect the level of BR expression, but surprisingly, the same pop-in/pop-out approach used for construction of the single mutants failed to produce a double mutant with stop codons inserted in both brb and bp2 or brb and bp4 genes. This may indicate such double-mutants have a negative effect on cell growth. Thus, the importance of these proteins as substitutes of Brb in bop transcription remains an open question. Using a GFP reporter assay, we found that light induction of the bop promoter takes place only when all three regulating factors are expressed, Bat, Brz and Brb. 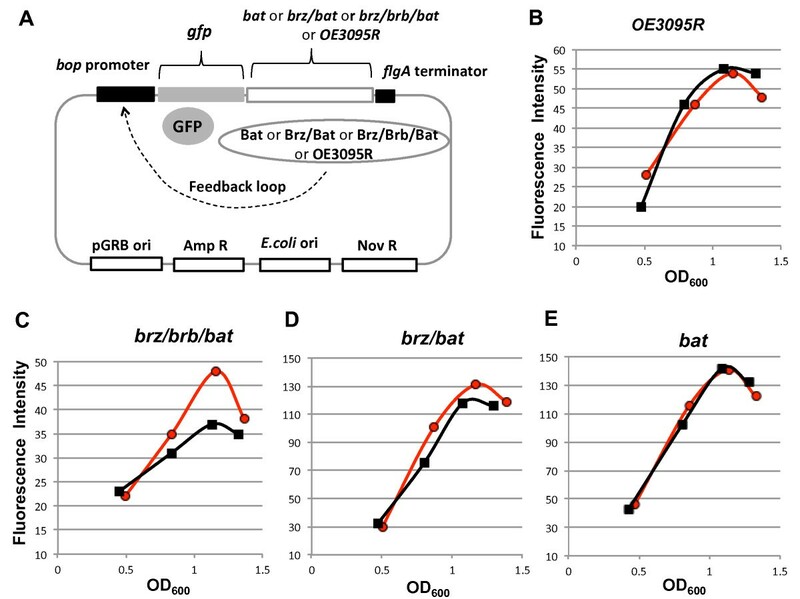 This indicates that Brb can be a co-activator of bop promoter in light (versus dark) when, additionally, oxygen is naturally and gradually depleted during cell growth. Expression of only Brz and Bat in the same conditions did not have a similar activation effect. Thus, the combination of these three proteins can be considered as an optimal set of factors to reach maximum activation of bop transcription in light conditions. Similar genes are also found in Hqr. walsbyi, indicating this regulatory network is not limited to Hbt. salinarum but is distributed among other haloarchaea. It cannot be excluded that this set of proteins (zinc-finger protein, small basic protein, and a flavin-containing protein) might activate transcription not only of bop, but also of other genes encoding opsin proteins in haloarchaea. In Hbt. salinarum, such genes can potentially be activated not only by Bat, Brz and Brb, but also by a complex comprising zinc-finger protein OE2447F (or OE3131F), basic protein Bp4 (or Bp2) and Bat as a flavin-containing protein. The Bat homologs Boa2 and Boa4 cannot have the same functionality as Bat since, in contrast to Bat, they do not possess a PAS domain containing a flavine binding site. A marked complexity of bop expression at the transcription level has become more apparent from mutational studies of brz and brb. While only mutations in Bat were previously suggested to be responsible for the Bop-overexpression phenotype of the S9 strain , our results demonstrate that mutations in both Brz and Brb can also contribute to this phenotype. Such multiple influences on bop transcription are possible if all three proteins form an interacting complex, and where changes in the ternary structure directly affect its ability to influence bop transcription. In addition, comparison of bop mRNA and BR levels in mutants and wild-type cells points to a tight regulation of both bop transcription and translation. BR levels were significantly lower at the early growth phase (OD600 = 0.7-0.8), but bop mRNA levels were relatively constant, and only slightly higher at a later phase of growth (OD600 = 1.1-1.2). This indicates a delay in BR biosynthesis despite the presence of bop transcripts. The complex regulatory network controlling BR synthesis probably reflects the huge energy investment required to switch to photosynthetic growth and so provides the cell with the ability to react when conditions are most favorable to do so. Based on our results, the activity of bop transcription is not only regulated by two major protein factors Brz and Bat, but is also tuned by an additional factor, a small basic protein, Brb. 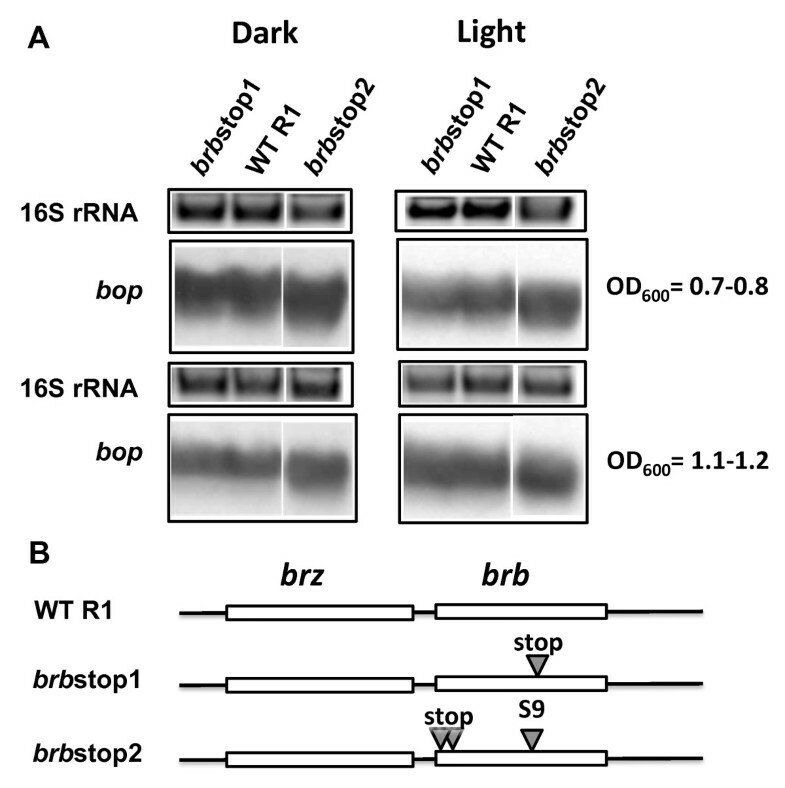 While Brb was not found to be as important as Brz and Bat, a cooperation of Brb with Brz and Bat was demonstrated to provide higher induction of bop transcription in response to light. Hbt. salinarum R1, R1M1 and mutant strains derived from R1 were grown in complex medium as described previously , either in the dark or under light. For all experiments, cells were cultivated in 35 ml of medium contained in 100 ml volume flasks, and the flasks closed by aluminium foil. Under these conditions, oxygen in the cultures is naturally depleted during cell growth. The E. coli strains DH5α and DH10β were used for transformation according to the supplier's instruction (Invitrogen). brb CBD, brb stop1, brb stop2, brz S9, brb S9, brz S9brb S9, brb M1, brz S9brb M2, bp2 stop and bp4 stop mutants were produced using the pop-in/pop-out method . For this, the plasmids were constructed by inserting of corresponding DNA fragments into the pVT plasmid  using Hind II, Bam HI, Xba I, Pst I restriction sites. The fragments were produced by PCR using corresponding primers (additional file 9) and verified by sequencing. To create the brz S9brb M2 mutant, the corresponding plasmid was constructed by cloning the brz S9brb M2 fragment selected from PCR fragments, amplified by using a primer having a randomly brb M2 mutation instead of the brb S9 mutation. Transformations were carried out by the PEG method [27, 28]. Transformants were selected using blue/red screening  by plating the cells onto agar growth medium containing 0.1-0.2 μg ml-1 of novobiocin and 40 μg ml-1 of X-gal . Cells from single blue colonies (pop-in) were propagated in culture medium without novobiocin and plated on agar plates containing 40 μg ml-1 of X-gal without novobiocin. Red colonies (pop-out) were checked for the presence of the respective mutations by sequencing of PCR fragments. For the amplification and sequencing of these fragments the corresponding primers were used (additional file 9). The brb M1 mutant was produced as a random mutant during selection of the brb S9 mutant. The brb-bgaH mutants were produced in result of the pVYT1 and pVYT2 plasmids insertion in brz-brb genes region (Figure 2; additional file 9). The plasmids were constructed by cloning bgaH and brb gene fragments into the pAN plasmid . The bgaH and brb fragments were PCR amplified using corresponding primers (additional file 9). Transformations were carried out by the PEG method [27, 28]. Transformants were selected by plating the cells onto agar growth medium containing 0.1-0.2 μg ml-1 of novobiocin and 40 μg ml-1 of X-gal . Northern blot hybridizations were done as described . DIG-labeled bop gene probe generated by PCR were used for the chemiluminescence detection performed with the DIG luminescence detection kit (Roche) according to the supplier's instructions. Densitometry was performed using program ImageJ64. For the bop gene PCR amplification primers 1 and 2 were used (additional file 9). Total RNA was prepared from cells, taken in every time series experiment, using the peqGold RNAPure kit (Peqlab Biotechnology) according to the supplier's instruction. For RNA gel electrophoresis 4-5 μg of total RNA were used per lane. To determine the 5' and 3'ends of transcripts 5'-3'RACE (rapid amplification of cDNA ends) was performed by the use of an RNA circularization mediated method according to Brenneis; 2007 . For cDNA synthesis and PCR amplification from cDNA primers 3 and 4, 5 were used, respectively (additional file 9). The obtained PCR-amplified fragments were cloned (TOPO TA cloning Kit, Invitrogen) and sequenced using M13 forward and M13 revers primers. The GFP reporter plasmid, pVTR, was constructed by cloning of following fragments into the pAN plasmid : multiple cloning site, pGRB origin of replication, bop promoter, GFP gene (smRSGFP), terminator of A flagellin (flgA) operon. The fragments were PCR amplified by using the corresponding primers listed in an additional file 9. The flgA terminator has previously been shown to be effective in plasmids described by Furtwängler; 2010 . 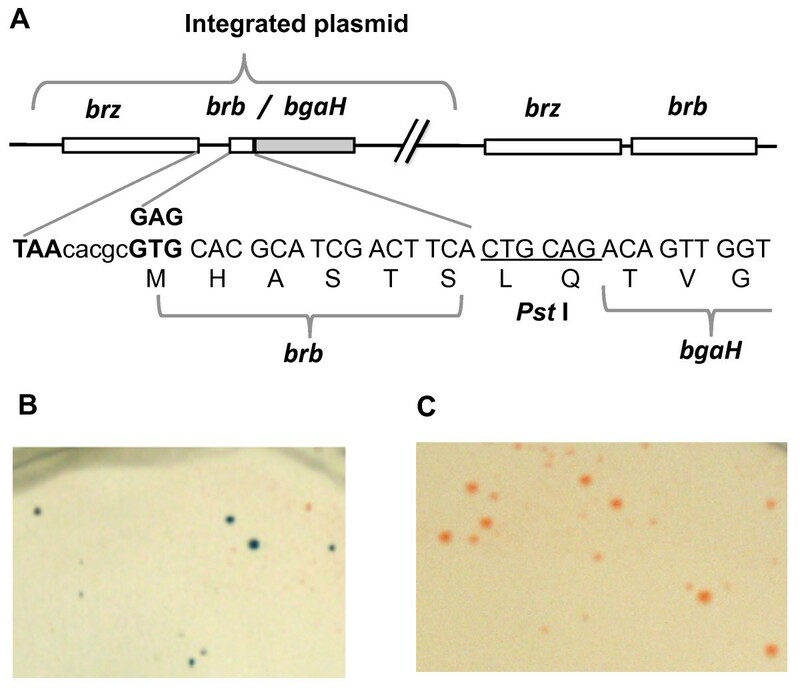 Different sets of the brz, bat, brb, OE3095R genes were cloned into the pVTR plasmid between the gfp gene and the flgA terminator. Transformations of wild type R1 cells by the reporter plasmids were carried out by the PEG method [27, 28]. Transformants were selected by plating the cells onto agar growth medium containing 0.1-0.2 μg ml-1 of novobiocin. Integrity of the reporter plasmids in the transformants was checked by a restriction analysis of the plasmids isolated from these transformants. For GFP fluorescence measurement, cells were centrifuged and lysed in 3 ml of buffer (10 mM Tris-HCl, pH = 7.5). For each measurement, equal amounts of cells were used. The absolute number of cells corresponded to 3 ml of culture at OD600 = 0.4. The wavelengths of excitation and emission were 588 nm and 610 nm, respectively. For BR measurement, cell samples taken in every time series experiment were centrifuged and lysed in 1 ml of buffer (10 mM Tris-HCl, pH = 7.5). For each measurement, equal amounts of cells were used. The absolute number of cells corresponded to 10 ml of culture at OD600 = 0.7. The lysates were treated with DNase I for 20 min at 37°C. Absorbance spectra were recorded from 200 to 800 nm and BR concentration was quantified from spectral decomposition performed to estimate the compositions of bacteriorhodopsin-bacterioruberin cell mixtures. Total RNA was prepared using peqGold RNAPure solution (Peqlab Biotechnology) from cells grown to an OD600 of 0.5. RNA (5 μg) was reverse transcribed into Cy3/Cy5-labeled cDNA using CyScribe First-Strand cDNA Synthesis Kit with enclosed random nonamer primers and Cy3-/Cy5-dUTP (both Amersham Biosciences, Freiburg). Labelled cDNA was hybridized to in-house fabricated whole genome DNA-microarrays  at 64°C overnight. To determine the fluorescence ratios the slides were scanned (GenePix 4000 B, Axon Instruments) and the data were extracted using the GenePix Pro 6 software. After background subtraction, pinwise normalization and data evaluation by a Student's T-test, those transcripts displaying a p-value equal or lower than 5 × 10-5 and a ratio of +/- 1.6 were selected as significantly regulated. A detailed description of the microarray design, experimental procedure and data-evaluation is described in [31, 32]. The data obtained from the microarray experiment for R1 strain were deposited at http://www.ebi.ac.uk/miamexpress under the accession number (E-MEXP-3219). We thank Locedie Mansueto for help in calculating the BR concentrations and Matthias Schlesner for providing the plasmid with CBD sequence. VT performed the majority of the experiments (5'-3'RACE, mutant construction and analysis, GFP reporter assay), study design and analysis, drafting the manuscript. RS performed microarray experiments and analysis. KF participated in construction of mutants and their analysis. MDS drafted the manuscript and participated in data analysis. DO conceived study, participated in its design and analysis, drafted the manuscript. All authors read and approved the final manuscript.